Guess what? It's Friday again (do they seem to be coming faster, or is it my imagination?) 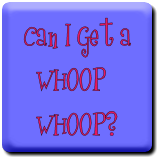 which means it's time for us to get our whoop whoop on! Are you ready? Let's get started! 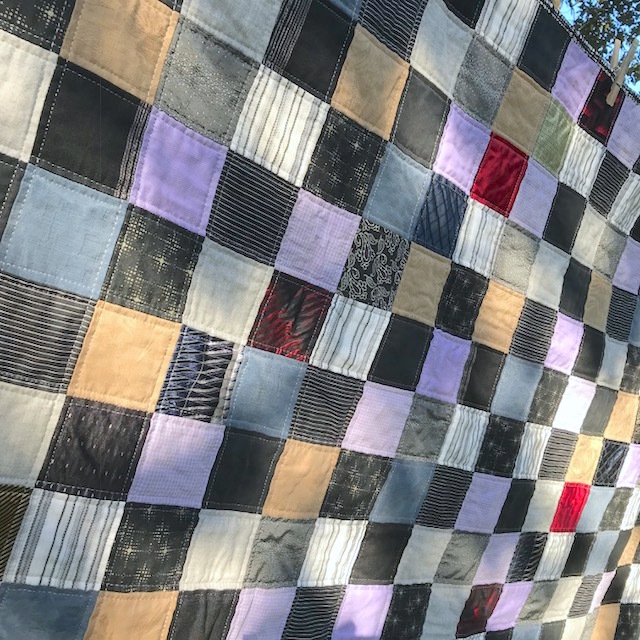 This one is made from pieces of dress shirts and silk ties. Lots of silky, slippery fabrics that required stabilizing before sewing. 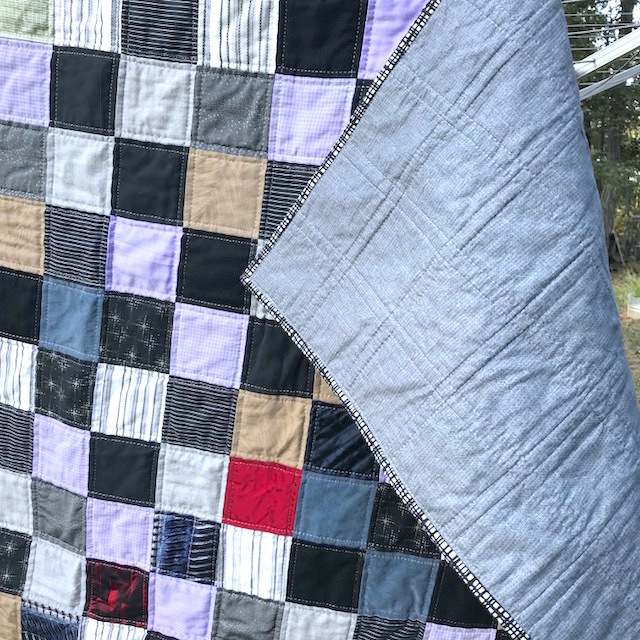 I quilted it using Glide thread in Battleship Gray - it has a wonderful shiny luster that shows up nicely against the dressier fabrics. And even the back looks nice, with that windowpane quilting! 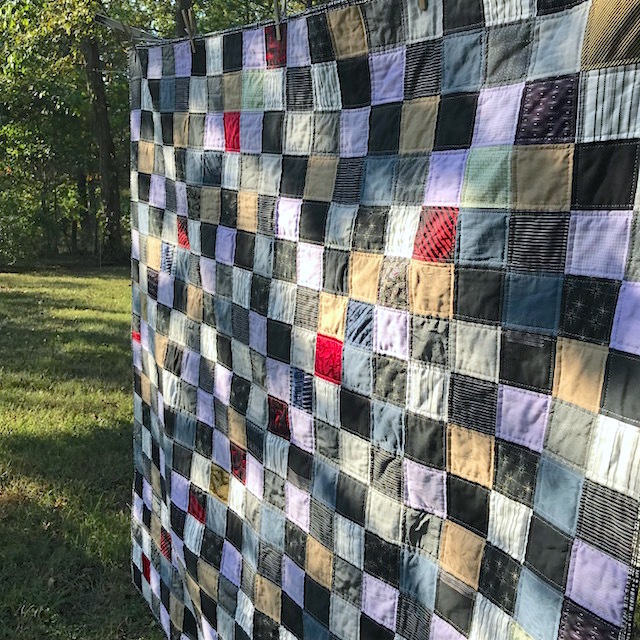 One more memory quilt to go in this job - hopefully you'll see that next week. Fingers crossed! And it's more fun to dance with friends! thanks for the great idea that sometimes simple is stunning! 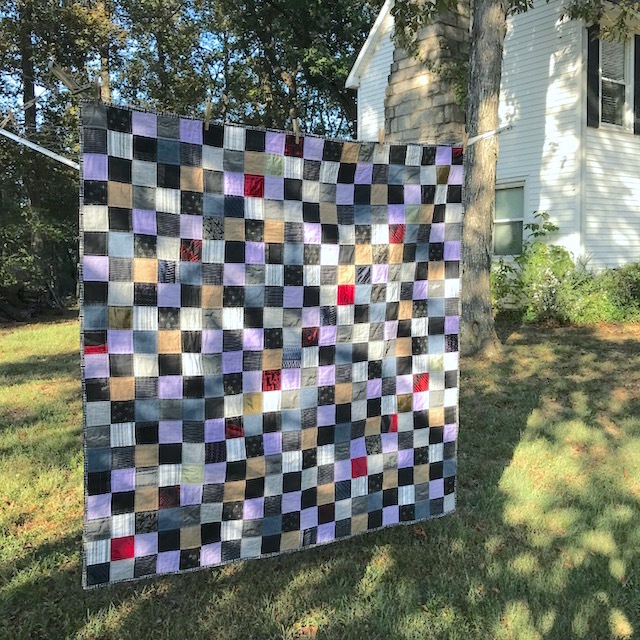 Love the newest memory quilt! The silky bocks will really be set off with the lustrous thread-great choice! Love this scrappy memory quilt with it's splashes of red. It's a beautiful memory quilt. I'm glad you had such a variety of fabric to use and love the splashes of red! Your quilting I'd perfect for this quilt. I wish I had checked your blog yesterday. Meaning before I quilted a quilt today. This would have been perfect! Make-a-List Monday - Are We Having Fun Yet? Can I Get A Whoop Whoop? Triplets! Make-A-List Monday - Enjoying a Taste of Fall! Welcome to the Quilters Meet & Greet! Make-A-List Monday - No Rest For The Wicked!